The night that Harvey ripped through Houston, I was drafting my September blog about the sunspots I’d seen during the solar eclipse. I hope to return to that topic in the future, but I’m currently consumed by dealing with the aftermath of this disaster. 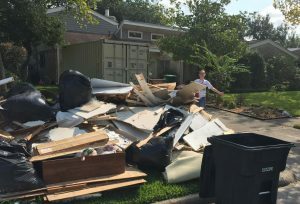 This is a photo of the debris pile from our house after flooding caused by nearly 50 inches of rain by Hurricane Harvey. In the background, the shipping container we are using to store some of our furniture sits on the driveway. We are currently sleeping on a mattress on the floor in the upstairs office we added on years ago. Because of materials and labor shortages, we don’t expect to have repairs done until Christmas, maybe longer. I’ve been sharing photos via Twitter and stories via Facebook if you want to know more about what it is like to go through a natural disaster which unfortunately, so many people are suffering through right now. Like most Houstonians, I’m determined to get through this and come out stronger and better with heartfelt stories to share. One thing I can say for sure: there are a lot of saints living here who have helped us move furniture, pull out wet carpet, scrape goop off the floors, bring food, store our stuff (including my 20-gallon aquarium full of fish! ), and offer prayers and encouragement. I’m grateful to them all. To help pay for our recovery, I’d sure appreciate some invitations for author visits and some added book sales. Check out my author website for my program options and books to order. Please consider purchasing copies of books by Houston authors, especially my artist Bruce Foster who lost his house, for gifts or to donate to Houston-area schools or one of the schools in Puerto Rico or Florida that were likewise destroyed by 2017 hurricanes. I am happy to announce that I’ve signed a contract with National Geographic Kids for a second children’s book with Apollo 11 Astronaut Buzz Aldrin! We haven’t settled on a title yet, but it will be a pop-up book celebrating the 50th anniversary of Apollo in 2019. The book is planned for publication next fall. The pop-up engineer is Bruce Foster of Harry Potter pop-up fame! I offer short programs and STEM workshops for adults, kids, and mixed audiences. 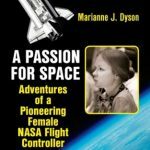 For programs and prices, visit: Dyson Author Visits. Sept. 22-24. FenCon. Westin Dallas Fort Worth Airport, 4545 W. John Carpenter Freeway, Irving Texas, 75063. 972-929-4500. Friday Sept. 22. 4-5 PM, Ticket to Ride-We’re Going to Mars! 5:30-6 PM. Reading. 6-7PM, Panelist for Space Fighters Don’t Make Zoom Noises! Saturday, Sept. 23. 12-12:30 Autographing. Sunday, Sept. 24. 10:30-11 AM Autographing. 2-3 PM Panelist. Spacecraft Engineering. Saturday, October 7. SCBWI Houston Conference. 8 AM to 6:15 PM. Attending and signing books. The Marriott Houston Westchase, 2900 Briarpark Drive, Houston, TX.